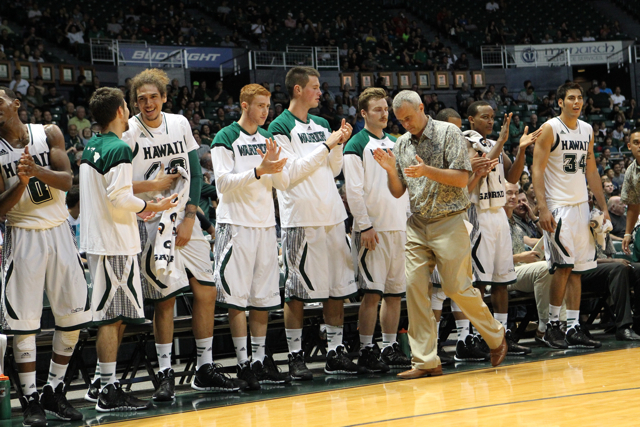 The University of Hawai’i Men’s Basketball Awards Banquet will take place on May 1 at the Sheraton Waikiki Hotel. No-host cocktails will begin at 5:30 p.m., followed by the dinner and program at 6:30 p.m. Individual tickets are $150 per person, and group tables and VIP tables are also available. CLICK HERE to purchase tickets or make a donation to the program. Deadline to purchase tickets is April 24. The Warriors recently completed the 2013-14 season with a 20-11 record – the first 20-win season since 2004. Total wins: 20 against any type of competition, and without question Gib and team so close to getting 23-24 wins and Regular season championship. Now, have to get that athletic swing combo athlete and a shot blocking athletic Big. Nice to see who gets Defensive player of the year, MOP, etc, inspirational, I think the Whole Team deserves the hustlet/effort award! Great uptempo, just could not get some heartbreaking games closed out for wins. Gib, you keep on recruiting, and awarding the deserving one ones on team. UH MBB fanbase, there is a solid several thousand, who want program keep on going upwards! We have confidence in team and what you and staff are doing to help UH MBB be an elite top 30 or better team every year! Should be great awards banquet, and we local and global fans, look forward to Dayton and WI report and video of event! Go Rainbow Warriors! 2014-15 big Season ,NIT or NCAA’s! Anyone know about Tyler Harville? Confirmed Walk-On for 2014-15? RODERICK BOBBITT SG, 6-3, 205 lbs. out of Indian Hills JC, Iowa. Visit in April? Combo guard. If lose weight and got to physical condition of freshmen year 3 years ago at Indian Hills, guy could be great addition to guard rotation. Where is the Big recruit, shot blocker? Sorry, where is The Big athletic shot blocker recruit to shore up and protect the rim, pretty sure, Gib and staff looking high and low, even May when those showcase, JC…AAU talent on display, Hard , very hard to lock down a 6’9″ to 6’11” big who can guard the basket. Weird the final four, you all check out their rosters? Arizona, Wisconsin, U.Conn., and Kentucky, No real rim protectors, as a team, 1-8 or 1-10, just play well on D , rebound, run, and crash the O glass. Those 3 pointers in tournament play? Live and die baby, if you hit that key 3 , team wins, miss, a little off, team loses, we have a different set of final four teams. So what is it? UH I believe now, emphasis, on 3 point, mid range shooters, guys that can put the ball in the hole out to 3 line, and be able to attack the rim with power, and finish. UH with Negus, Jankovich, Nevels, Smith, Fleming, and possible addition or two, can do it. I think that is the shape of NCAA deep run teams, hit the three, defend and rebound, and get that ball to bounce your way. Hey, UH, winning a couple and getting to sweet sixteen or better next year? Why not, win the BWC tournament in March 2015, and be on fire, why not final four! Or is that AAU…JC showcase in June? I forget, however, if Gib does not sign April early, can still sign guys till May, and actually before School starts in August 2014. Go Gib Go, get a shooter and an athletic big, hard to do, right fit, high character, love Hawaii, and will help team get to NCAA’s! That is goal of Shoji every year, with 4 national titles under his belt, and the Mike Wilton, team with Costas T. who actually won the MVB national title against Penn. St. back in 2000 or 2001! They still got the rings, . Go For it Gib and team, set goals high, however team, get waaaay better off season, get faster, stronger, BBIQ smarter, and shoot better, rebound better, handle ball better, and close games out better, NCAA bound! playhoopsa I have to disagree with you. no real rim protectors? i’ll name them for you each final four team Florida Patric Young 6-9 240 40 blocks this year , Uconn Amida Brimah 7-0 217 89 blocks this year, Wisconsin Frank Kaminsky 7-0 234 64 blocks this year. and Kentucky Willie Cauley-Stein 106 blocks this year. If you compare them to Hawaii Fotu and Rozitis led the team with 24 blocks each. Just maybe, the intent is to recruit more athletes that are long and lean. It maybe tougher to recruit a dominating big, with so many BCS schools out there. Looks like more and more schools are opting for the longer and leaner types, play uptempo offense and lock down defense. Both our transfers fit that mode, believe the remaining question is their ability to play lock down defense. Would love to see another 6′ 8″ or 6′ 9″ hybrid forward in the Christian S. mode that plays defense with the same passion and with hops; that would be the final piece to the puzzle with Isaac and the (2) Stefans. David: My apologies. You are right, I should have read the stats of the final four teams. Just noticed that Florida, Wisconsin, U.Conn. and Kentucky, were not extremely tall across their whole roster, i.e. like UC Irvine and Mamadou, however, those teams definitely have McDonald’s AA’s and top 100 athletes, all state, all region and global great basketball players. That is why , I think Hawaii can compete eventually with those teams. Parity, Gib has to recruit as tako says, the lean long, type not necessarily the 7 foot plus athlete. Would be nice if Gib got a good one, a JC with 3 to play incoming soph, or great ready to play JC Jr., or a global/HS 4 year long athletic 6’9″-6’10” last line of defense rim protector. This year’s NCAA tournament, tremendous games, and the so called upsets of higher seeds show the PARITY in NCAA ball today. Anyone one of perhaps top 200 RPI teams in nation can beat each other. UH can be one of them, Hopefully next season, that magical NCAA run! Go Rainbow Warriors! Hope Gib will find that athletic, long shot blocker. As we know, and a guy who is not afraid to get physical, in the NCAA tournament, they let them play..wow! Still think Gib is looking for one more athlete who can score, UH would get stuck sometimes in those close games, with no one to hit the big 3 , or go to rim and one. Maybe Bobbitt , or Flemings might help? And of course, improvement on offense and defense of Shamburger, Smith, Nevels, and hopefully a 100% healed Jawato. Having those guards coming back, is really key, the experience of a 20 win season, and knowing what to do to finish games. Should be great 2014-15 season, I am really excited about it. Come on Nov 2014 first game, cannot come soon enough! You don’t need to be 7′ tall to be a shot blocker. There are some very good shot blockers in the 6’7″-6’10” range. It’s more about being athletic, long armed and having good timing. Fotu getting 24 blocks was pretty good as he’s not a defensive presence. He’s gotten more explosive this past year, and his improved quickness has helped a lot. I do want to see more of Jovanovic next season. I liked what I saw from him in his very limited minutes this past season. He’s a high effort player, (I think Rozitis has had a good effect on him) and has some length. He’s got more athletic ability than Rozitis and from his open gym videos and game time play, he can score when he gets the chance. He’s got the size to fill the big man role, but he needs to play more and get blocks on film for other teams to look at. I don’t see much activity in the recruiting of big men thus far, so maybe Gib and staff are satisfied with Jovanovic’s skillset to not go after another big body. I think the potential is there, just Jovonvic just needs a chance to prove himself. I think Jovanovic is further ahead in his first year than Bill Amis was when he arrived. But then not too many guys got the work ethic and dedication that Bill had. We will see if Jovanovic is hungry to do something about it. We might be the only division 1 team with 20 wins and not make it to post season. If we are to improve on next year we need some kind of inside presence on defense. The way it is now guards just come swooping in to the basket virtually uncontested. We need an enforcer down there that will make guards pay if they decide to take it to the hole. Maybe you can’t stop a hot shooter. But you can stop penetrators or make them adjust their shots. All the big programs got those type players. If you don’t have it it’s like putting money in a pocket with a hole. I wouldn’t put it past Gib but I have a feeling he’s hounding some shot blockers and will bag one soon. I think we’re all in agreement that a big shot protecting center would help out the program immensely. However, every team is looking for one of those and they are hard to come by. I think Gib needs to go after the best players regardless of position if that Center that we hope for is not available. get your tickets to the dinner now, $150 per head, the steak dinner smells awesome ! plus all the deserts , great food at the Sheraton!